Sympathetic animals help a little boy overcome a bully, and they do it by providing unconditional friendship and a joint effort. We meet the miserable lad sitting on a hillside, quite alone. He is approached by the animals, one by one, and in rhymes they ask what the problem is. But the trouble is too deep and too important, and all the boy can say is, ‘Leave me alone’. When they persist, he finally explains: ‘My problem is a giant so big he blocks the sun, who teases me and bullies me every day for fun.’ When the bully appears, he is indeed a huge giant with red eyes, and the pictures become dark and menacing. But the brave little animals shout as one, ‘Leave him alone’, and the giant turns and ‘walks away’. The message is clear: there is safety in numbers and friendship can make all the difference, but the message is given with such a humorous lightness of touch that it comes over as an engaging story. The illustrations, full of funny but sensitive and understanding animals, are a super match for the text. 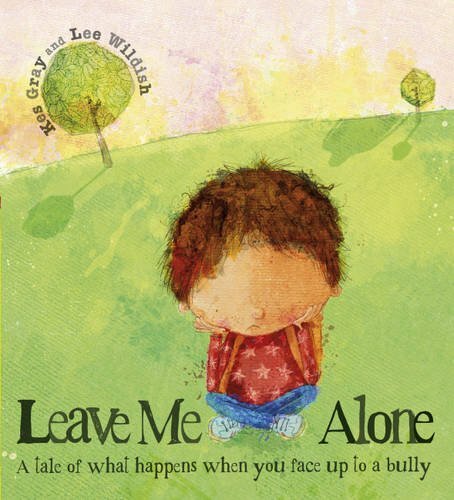 This picture book could be used with children suffering from any kind of violence, not just bullying, and if used in a classroom situation it will emphasise the importance of providing friendship and support to a child in trouble.